It was a beautiful day outside so I decided to grab the MacBook Pro and enjoy the delightful weather out on our screened in porch. I had some online reading to do as I am trying to get a handle on Git, the version control system I am going to be using. While sitting here enjoying the breeze and working through the Git documentation I remembered that I had left Adium running on the Mac Pro downstairs. Many of my friends contact me through AIM and I usually put up an away message if I’m gone for a while. But I just sat down and got comfortable – getting up seemed like a lot of work to me. 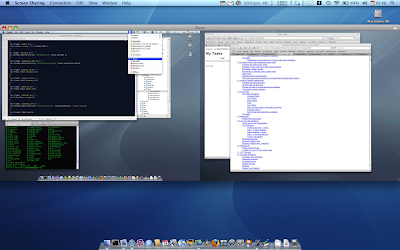 I decided that now was the perfect time to try out Leopard’s Screen Sharing capability. Even my dual monitors were represented. I tried playing around a bit and found it to be quite responsive. I had the option of either viewing the screen in scaled mode or by scrolling it. I found the scaling worked better for what I needed to do. Granted, the menu bar was extremely tiny but I could make out the little Adium icon and quickly set my status to away. Having accomplished this little mission I thought to myself: I wonder if I can gain access to my Ubuntu machine from the comfort of my screened in porch too? It physically sits right next to the Mac Pro and resides on the same network. I use SSH all the time to remotely connect and run tasks but I had never tried accessing my Ubuntu machine using a remote screen sharing application. 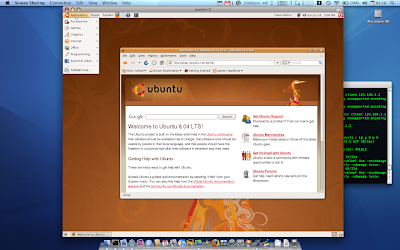 Apple’s Screen Sharing program is based on VNC, which I knew was available for Ubuntu. With this little hacking challenge on the table I decided to dig in. First I ran SSH and connected to my Ubuntu machine. Next I followed LifeHacker’s nice little four step instructions for getting VNC up and running on Ubuntu—something that could be handled through my SSH connection. The performance of the connection was terrible compared to the performance I got from the Mac Pro, though it was functional. I didn’t tweak it at all; I just did it because I could, so I’m sure there is room for optimization. I don’t know why but there is something tremendously satisfying about remotely controlling a machine, especially one you didn’t have the ability to control when you sat down. With my little remote adventure out of the way and this blog entry written up I better get back to that Git documentation.